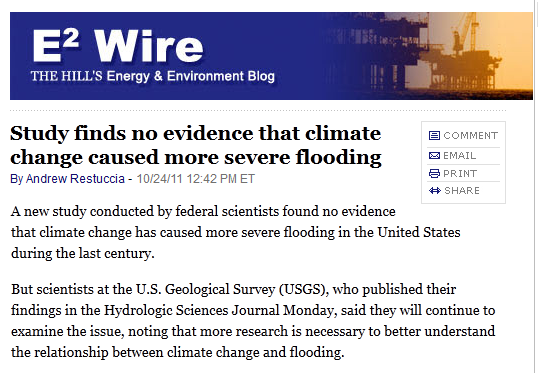 Climate change to flood link – no evidence | Watts Up With That? Another climate FAIL. Add this to tornadoes and hurricanes not being linked either, and you find that the entire Joe Romm / Bill McKibben alarming industrial complex of doubtful linkages between weather and climate has pretty much collapsed. The USGS study — titled “Has the magnitude of floods across the USA changed with global CO2 levels” — found no clear relationship between the increase in greenhouse gas emissions blamed for climate change and the severity of flooding in three of four regions of the United States. Has the magnitude of floods across the USA changed with global CO2 levels? Statistical relationships between annual floods at 200 long-term (85–127 years of record) streamgauges in the coterminous United States and the global mean carbon dioxide concentration (GMCO2) record are explored. The streamgauge locations are limited to those with little or no regulation or urban development. The coterminous US is divided into four large regions and stationary bootstrapping is used to evaluate if the patterns of these statistical associations are significantly different from what would be expected under the null hypothesis that flood magnitudes are independent of GMCO2. In none of the four regions defined in this study is there strong statistical evidence for flood magnitudes increasing with increasing GMCO2. One region, the southwest, showed a statistically significant negative relationship between GMCO2 and flood magnitudes. The statistical methods applied compensate both for the inter-site correlation of flood magnitudes and the shorter-term (up to a few decades) serial correlation of floods. Citation Hirsch, R.M. and Ryberg, K.R., 2012. Has the magnitude of floods across the USA changed with global CO2 levels? Hydrolological Sciences Journal, doi: 10.1080/02626667.2011.621895. In prior times, saying that further studies were important to determine that your conclusions held water (so to speak) was standard. Now it means that the opposite conclusions can still be held to if you want to. No signs that GMCO2 is a problem, but it COULD be a problem, so let us and our buddies keep working (with your money). On the climate issue nobody can be a skeptic and still get the paycheck (at least if he is a little guy). If you can’t find a link keep looking until you can. If you still can’t find one and you have spent over a $1B then make it up – that’s climate science! “….noting that more research (i.e. MONEY) is needed to better understand…..” sigh……. Sounds to me like they put out the report before the handlers got a chance to drool…er comb through it. Look for this to get little to no reporting until a connection can be possibly alluded to if one tilts their head just right, holds their left earlobe between their right thumb and ring finger and sings Baa-Baa Blacksheep in front of a picture of the Gore-acle. As someone who spent 6 months as a USGS intern while in grad school, I came to the conclusion they are one of the finest organizations ever funded by my tax dollars. What is this? The government scientists’ welfare line? Does this just emphasize the point that we all need some sort of measure of what ‘climate’ is – a Climate Index if you like. Something that somehow combines temperature with rainfall, windspeed, sunshine hours, dew-point and windchill. Maybe also include some sort of measurement in plant growing season length and/or degree-days below freezing. Such an index would be localised over quite large areas – Texas’ climate might be improved with more rain/less sunshine whereas North West Europe’s would be improved with less rain/more sun. Is this basically the Null Hypothesis and puts the ball firmly in the warmista’s court – they’re claiming that the climate is going to change – what measure of it are they using apart from just temperature? How do you something is changing without a start point or reference condition? Well, that’s about that…….. we’re not flooding more, hurricanes aren’t increasing in either intensity or frequency, and the same can be stated with tornadoes. Temps are flat-lining,…… turns out the albedo effect was entirely overstated, sea-level isn’t rising, in fact there’s significant evidence that says the 3mm/yr was overstated/invented. What was it again we were suppose to be so afraid of that we should entirely destroy the worlds socioeconomic structure and thwart human progress for? There is “virtually no evidence of increases or decreases in flood magnitudes” during the last 100 years in the northwestern and southeastern United States, USGS said. “Yes, but there is a tiny, tiny shred of evidence, and that we would like to inflate to disproportionate size”…who is this fellow named “USGS”? And why does he use this “V” word? Interesting quotes from the article. I wonder how the relationship will play out as more data is accumlated? I can’t access the original, but what is the number associated with the “strong statistical evidence” standard? 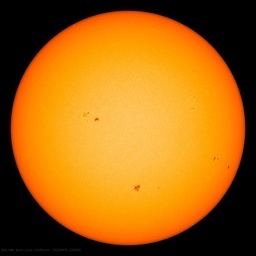 Just wondering if they can’t even find any at the wishy-washy 90-95% level so beloved of Climate Pseudo-Science. I’m surprised that any government agency would fund & allow the publishing a study against CO2 caused warming. Jesse: I suspect that the USGS allowed this study to be publilshed because it isn’t important enough to be stuffed with ‘correct thinkers.’ I also suspect that this will change. It has been more than 15 years, but when I was associated with the USGS it had an outstanding reputation across the board – industry, government, acadamia. I doubt that has changed. Flooding is a useful tool for research on temperature, because the occurences are public knowledge. It allows anyone. . . anyone. . . access to raw data. As I have seen here at WUWT Geologists are generally “inoculated” against CAGW because they take the very very long view of history. It is really sort of hard to get in a panic over a few tens of a degree temperature change after studying glaciation. It also doesn’t help that geologists are well aware the next temperature “Crisis” is much more likely to be a return to an ice age. It is really sort of hard to get in a panic over a few tens of a degree temperature change after studying glaciation.